How to Check if your Site is affected by Manual Web Spam Action? Search engines are always trying to return the best possible results to their readers, and you often see search rankings for websites going up and down. This is because they're regularly updating their algorithms, and changing their search ranking criteria, so that the most relevant and the best possible results can be returned to the searchers. Websites often come under penalties, some of which can be algorithmic, while others manual. Google has now introduced a new feature in Webmaster Tools that will show all manual actions against your site that directly effect your site's ranking in Google Search. You'd think that with so many websites out there, there's a very slim chance of a Google employee going manually through your website, and penalizing it for wrong SEO practices. But you wouldn't be entirely correct. You see, manual action is taken only if a website gives away dangerous signals to a search robot, in which case it might get flagged, inviting human moderation. But as statistics suggest, manual actions against sites are rare. Only 2% of the websites ever get penalized. It's hard to really irk Google, and mostly, whatever wrong practice you do, it won't be severe enough, unless you're generating user spam, or something like that. However, if you really believe you've been manually penalized, you can check it in two ways. First, Google will send you a message in Webmaster Tools alerting you about the wrong practice(s) you're doing. If you missed the messages, you can now do a live check with the new tool Google introduced. 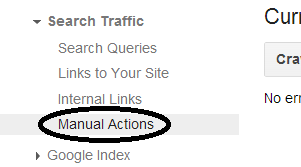 You can access this tool by going to your Google Webmaster Tools dashboard, and then, Search Traffic >> Manual Actions. There can be different types of manual actions. Some can be site wide, while others partial. Partial means there's a problem with only a specific section or page of your website, for example a forum page, where users are generating a lot of spam. Such problems can easily be fixed, whereas site-wide penalties are harder to correct. Whatever the cause though, Google will always give you a reason for penalty. And you can then take steps to correct it. Once done, you can simply file a reconsideration request, and get your site back to normal status. I have learned many things from this blog. but this is first time That I am gong to ask something directly. The problem is that I am running a blog for 6 months, but nowdays some time my blogs domain redirects visitor to google's home page directly. And its not only with my blog but when my blog redirect to google, at the same time I try to visit MBT, and it also redirects me ( and some other blogs too. ). I am realy nervous that why it is. Plz tell me why is this. Very helpful Bro! There are many minute things that we should consider which if it is ignored, our blog will suffer.Thanks and More Power to your Family! Thanks for sharing, great blog. I will try to apply your tips on my blog. Very accessible Bro! There are abounding minute things that we should accede which if it is ignored, our blog will suffer.Thanks and More mensagens com frases | poemas De Amor Power to your Family!